Options: Backset, strike, and finish must be specified when ordering. For information on handles, paddles, and lever operators, see TRIM. See ELECTRIC STRIKES for compatible access control products. 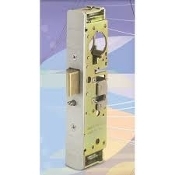 See 4920AN Heavy Duty Deadlatch (ANSI Size) for wood and hollow metal door applications. Standard Package: Individually boxed with flat and radius faceplates, strike, and machine screws for mounting. Order cylinders, paddles, handles, or lever operators separately. Shipping weight: 1-1/4 lbs.